Notre Dame junior Taylor Schmidt fields a ball in the Titans’s 11-4 win over rival Clay last week. PORTSMOUTH — Conference races are starting to heat up as pivotal matchups loom large in the coming days. As we enter the fourth week of the spring sports season, take a look at this week’s edition of Extra Bases. A. So … Notre Dame is as good as we all thought, or even better. 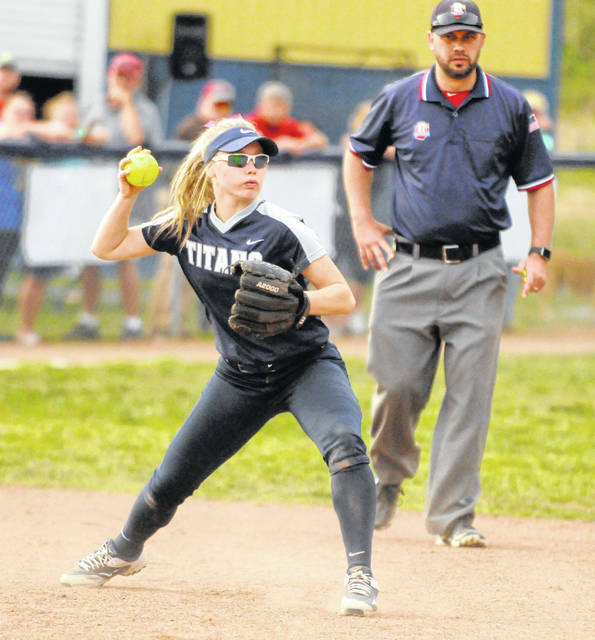 The Titans’ 11-4 win over Clay this past Thursday showed that and then some. Up and the down the lineup, Notre Dame is strong and with a pitcher like Cassie Schaefer in the circle, we could be looking at a team that goes really deep into a tournament run — like deeper than the Titans’ basketball team. Coach J.D. McKenzie has a plethora of weapons at his disposal to work with. His team is fun to watch. B. Speaking of weapons, Green baseball has an arsenal to choose from as well. The Bobcats, somewhat quietly, stand at 12-1 overall after dismantling South Gallia this past weekend by scores of 12-0 and 31-5 — yes, that’s an actual score. With Bryce Ponn, Tanner Kimbler, Tayte Carver, Levi Singleton, etc. leading the charge, Green is sitting atop the league standings, right next to Clay. The Bobcats and Panthers are scheduled to meet April 24 and April 30. C. Minford and Wheelersburg split its SOC II baseball series this past week, which means the conference race down the stretch is going to be extremely interested. With the Falcons and Pirates at one loss each, games against Waverly for each come into the forefront. If the Tigers can steal a win this week or next, somebody gets thrown back into the driver’s seat. Minford has two games against Waverly this week while ‘Burg starts its two-series with the Tigers on Friday. In Green’s 28-3 win over Western, Ava Jenkins was 5-for-6 with a home run and seven RBIs. Those are real numbers, folks. In Wheelersburg’s 2-0 win over Minford Friday, Jalen Miller threw a two-hit, seven-inning gem. Miller struck out three batters while holding one of the area’s most dangerous lineups at bay. Hailey Robinson led Waverly past Clay Tuesday evening with a 3-for-3 day at the plate, including a double, a triple and three RBIs. She also earned the pitching win, throwing three innings and striking out four. Another big week calls for another fun week of coverage. Minford travels to Waverly Wednesday for what should be two good games, baseball and softball. Then, Friday, Waverly travels to Wheelersburg while South Webster travels to Minford for a baseball-softball meeting.